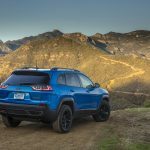 Refinement appears to be the order of the day at Jeep, which is adeptly achieved by the 2019 Cherokee Trailhawk Elite with its new look and on-road performance. Sometimes it seems as if nearly every buyer wants to end up with a stylish sport utility, or a crossover version of one. But crossovers, built with unit bodies like cars, are mostly wannabes when it comes to venturing into the boondocks. They usually have all-wheel drive and decent ground clearance, but the capabilities end there. Not so the Jeep Cherokee. 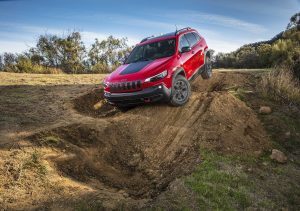 Like every Jeep, it has solid off-road credentials, abetted by such enhancements as four-wheel drive with a low range and lockable rear differential, crawl speed capability, hill descent control and skid plates-all there to match up against rocks, snow, sand and mud. At the same time, it’s a decent highway cruiser with a new 270-horsepower, 2.0-liter turbocharged four-cylinder engine that makes 295 lb.-ft. of torque — useful both for difficult slow-motion off-road adventures and on-road acceleration off the line, which happens without that dreaded turbo lag. There’s hesitation if you use the default engine automatic stop-start system. Fortunately, the stop-start can be disabled by simply touching a button on the dash, which was my preference. The engine sends its power to the wheels through a nine-speed automatic transmission with a manual-shift mode. Though the Cherokee gets quickly off the line, punching the gas pedal underway to downshift into a passing gear usually results in a lurch before the power comes on. Though mechanical and road sounds are mostly muted during freeway cruising, engine noise exists under hard acceleration. The ride, as might be expected with a solidly sprung off-road capable vehicle, is truck-like on all but the smoothest roads. The suspension system stiffness, along with stable steering, paid off in capable handling with little body lean on curving roads. 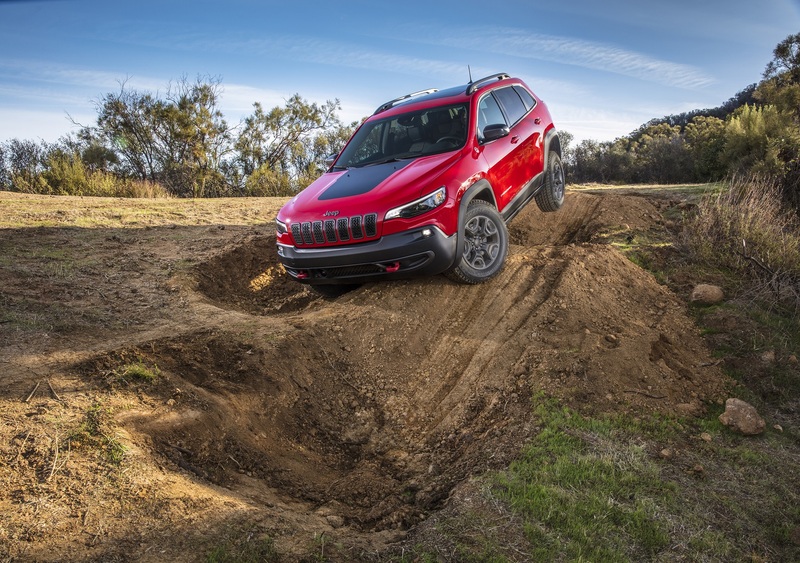 The tested Cherokee Trailhawk had a curb weight of 4,260 pounds, including that off-road hardware. On the government’s city/highway/combined fuel consumption ratings, it managed 20/26/22 miles per gallon for city/highway/combined on premium gasoline. The most noticeable styling change from the 2018 Cherokee is its front face. 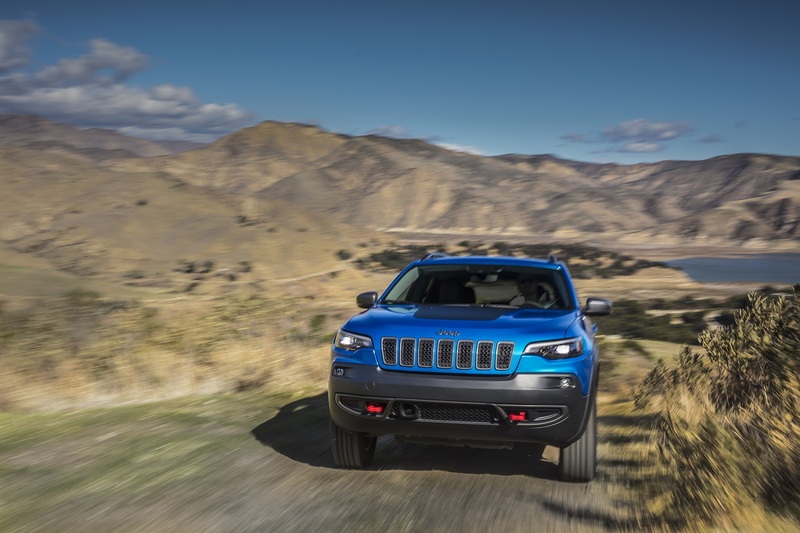 It has Jeep’s signature seven-slot grille but the low-down headlights have been relocated and combined with the daytime running lights, giving it more of a family resemblance to its bigger sibling, the Grand Cherokee. Inside, the tested Cherokee Trailhawk Elite was fitted out as well as some luxury SUVs. Standard and optional equipment included collision alert with automatic braking, rear and parallel parking assist, blind-spot warning, cross traffic alerts, Apple CarPlay, Android Auto, SXM satellite radio, navigation system, memory setting for the power driver’s seat, perforated leather upholstery, heated front seats, adaptive cruise control, lane departure warning, panoramic glass sunroof and rain-sensing windshield wipers. Infotainment functions are displayed on FCA’s UConnect 8.4-inch center touchscreen. The system has been praised by critics for its ease of use. Inside accommodations included multiple seat adjustments and a fat-rimmed steering wheel for a confident grip. Front seats were comfortable and supportive with big seatback bolsters to hold the torso in off-road rocking and pitching. Comfort was similar in the outboard back seats, with okay head and knee room for average-sized adults. Rear seatbacks fold nearly flat for additional cargo space. 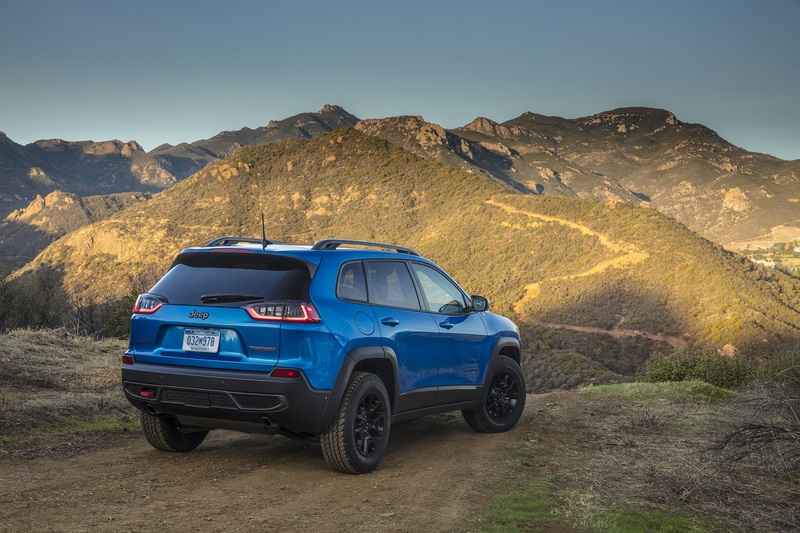 The Cherokee Trailhawk has 102 cubic feet of space for passengers — about what you find in a midsize sedan — and 25 cubic feet for cargo behind the rear seat. A full-sized spare wheel and tire is stashed underneath the cargo floor. Offered in five trims the 2019 base price starts at $23,995 for the Latitude trim. The 2019 Jeep Cherokee Trailhawk Elite came with a starting price of $34,765. Competitors include the Subaru Forester, Volkswagen Tiguan, GMC Terrain Denali AWD and Jeep’s own Wrangler Unlimited four-door, which also has been considerably refined for on-road performance, making it a contender as a family wagon.